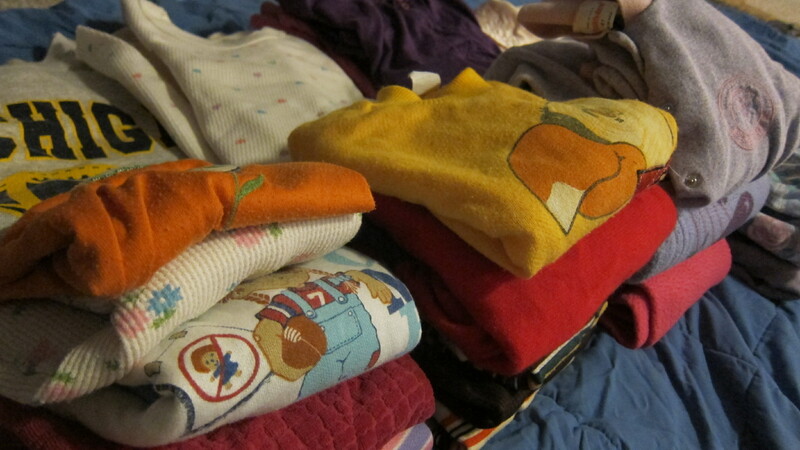 Week 16 – Clothing, boxes, and coupons.. Oh my!! Last week was quite fun nearly killing myself in the garage. So now I’m going back to cleaner pastures back upstairs. I have decided to start wearing a dust mask since I have gone home feeling absolutely horrible every week after I’m in the house. My nose starts running immediately when I walk in and I can’t imagine the air I’m breathing is healthy. I also had a weird musty/woody smell affixed to me that would NOT go away after working in the garage, so I’m avoiding that area for now. I’m guessing I will also have to wear gloves in the future when working with the dirtier items. While I was at my parent’s house over the weekend for the hazardous waste drive, I decided to spend a little extra time digging further into the attic room. As I was rumbling through the room I was shocked when my mom asked if I wanted a grilled cheese sandwich for lunch. Um, what? I thought this could be a ploy to distract me, but in the end it was a nice and welcome surprise. I guess she doesn’t hate me as much as I thought. Either way, spending the extra hour or so helped because I was able to organize a bunch of items for later in the week. I figure it will cut down the amount of time I spend going through things and I can basically go in, load my car up, and leave. I was surprised to find more bags of coupons and cardboard boxes for almost anything we ever bought as children. I basically spent most of my time breaking down boxes! I went back later in the week and as always, as soon as I walked in the attic room, my mother comes upstairs. She asks “so what are you doing today?” I respond “same thing as always, mom.” Surprisingly, she actually helped me carry everything downstairs today. I think this is more so she can see what I’m taking out than actually wanting to help though. I have learned to hide certain bags from her and take them out to my car quickly so she can’t go through them. I got caught this time as she asks “what did you take to the car that you didn’t want me to see?” I had to laugh a little at the fact that I was caught. I explained that it was all paper and I didn’t want her to see it because she would have gone through everything and it’s frustrating after I spend so much time going through it to begin with. Clothes for Goodwill! I don’t think any of these clothes were actually ours.. Hmm..
As I go through these extra rooms, I am still surprised when I find bags and bags of clothes. I have come to the realization that we have so many clothes in the house. 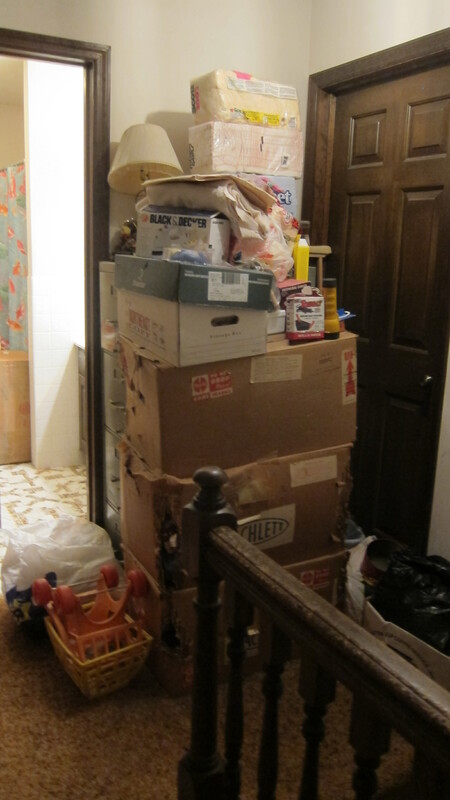 Since we were younger, there have always been 3 big boxes of clothes stacked at the top of the steps. They make it so hard to get stuff out of the attic room, so I decided to take one into the other room and go through it. Most of the clothes with elastic in them are so old that they are no good. This is almost a relief as I don’t have to fight about getting rid of them with my mother. She helped go through the box with me and was happy to separate the clothes for recycling. Unfortunately, I don’t think any will be good candidates to sell since they have been sitting in boxes for almost 25 years and smell like cardboard. I ask her to help me get bags of clothes out for goodwill and she helps me sort two bags, so I’m happy with this. A few weeks ago I exclaimed that there is one thing my mother loves more than newspapers. That is money. I had made her pinky swear that she would owe me $100 if she didn’t have 4 bags for me the following week. I was really happy when she kept up with her side of the deal and delivered 4 bags the following week. Unfortunately, I have had problems getting newspapers consistently from her since then. I figured I would try the bet once again. This time she would owe me 6 bags or $100. I had high hopes since she was able to follow through with this a few weeks ago. I was quite disappointed when I asked and she only had one bag for me. She stated that she felt overwhelmed by the thought of 6 bags and said it wasn’t a good way to motivate her. I guess its back to the drawing board! 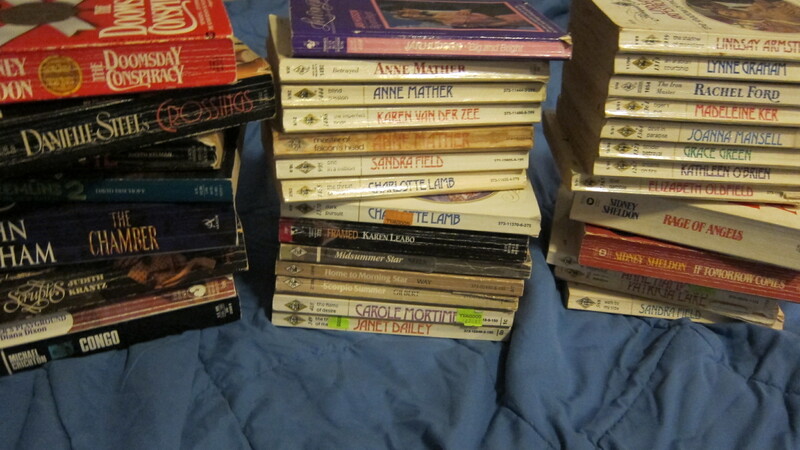 Overall, I was happy because I was able to take a box of old books, a bag of misc. papers, a new kids on the block poster, some small rugs, tin cans, a bag of plastic, and a bag of styrofoam out. This entry was posted in cleaning up, Clothes, clutter, Daughter, donation, hoarding, mother, Motivation, newspapers, Organization, recycle and tagged child of hoarder, cleaning, clothes, daughter, donation, hoarding, mother, motivation, newspapers, recycle by shecleansup. Bookmark the permalink.